Ralph Ludwig Boyer was born in Camden, New Jersey on July 23, 1879. He attended the Pennsylvania Academy of the Fine Arts where James Daugherty was a fellow student, and where Boyer met his future wife, Rebecca Hunt, who was also a student. He won the Cresson Scholarship for travel throughout Europe. When he returned Boyer took up portrait painting and in World War I served in a Marine Corp Camouflage Division stationed in ship building yards and ports. Showing skills as a leader, he was promoted to lead the Baltimore unit. In 1920 he married, and for a time the couple lived in New York City. They moved to Westport, Connecticut three years later. Boyer was elected a Fellow at the Pennsylvania Academy. By the Great Depression, he was known for his etchings, murals, and stained glass art as well as for his book and magazine illustrations. He worked for the Public Works of Art Project, a predecessor to the WPA Federal Arts Project. For the WPA, Boyer completed 180 works, most of them etchings, many of which were duplicates of the same subjects. He also did five plasticine sculptures. Not done under the WPA was a commission with Kerr Eby to paint murals for the Bridgeport Brass Company as an artist-in-industry. The company was so impressed with his portraits of workers and managers alike and murals of office and assembly line scenes that they gave Boyer a pension. He died in 1952. 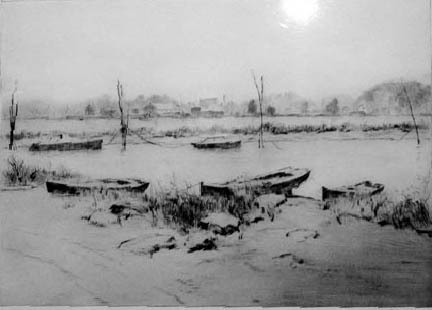 Boyer, Ralph Ludwig, “Shoreline,” Westport Public Schools Digital Collections, accessed April 25, 2019, https://collections.westportps.org/items/show/517.